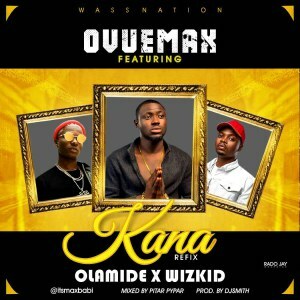 While a lot still enjoy his last single #ASSURANCE REFIX FT DAVIDO as it still trend on all social media, OVUEMAX is giving his fans another hit making it second single in less than two weeks, this time #KANA REFIX ft YBNL boss OLAMIDE as well as the Starboi WIZKID. This is sure to be another hit and street anthem as he talks about Nigeria youth and government. Produced by DJ Smith, Mixed & mastered by Pitar Pypar.